That the highly futuristic BMW i8 is finally here! The BMW i8 India launch has just taken place and the new model has gone on sale for a rather stratospheric INR 2.29 crores. Quite obviously, the car comes to us via CBU route. The i8 made its India debut at the Auto Expo 2014 in January last year. The i8 showcases BMW’s technological prowess and will serve as the perfect halo car. We believe that the launch of the i8 will pave way for other hybrid vehicles, such as the BMW i3, to come to our shores. It is being said that BMW India has planned to come up with ‘iDealers’ in Delhi, Mumbai and Chennai to sell the carmaker’s hybrid range. In India, the BMW’s i brand will co-exist with the manufacturer’s luxury car range and M branded performance models. The i8 has been on sale in international market and has been rather quick in establishing itself in the hybrid car industry. The i8 offers performance that one would associate with a sportscar and yet, has fuel efficiency that is comparable to a small family car. 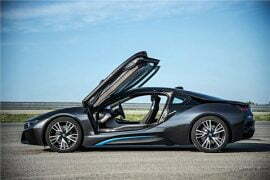 The i8’s electric motor pumps out a maximum power of 357bhp and a peak torque of 58.06 kgm. While these figures don’t sound too exciting, at least not when you compare them with supercar specs, the fact that BMW i8’s carbon-fibre and aluminium construction has led to a really low kerb weight should impress you. For the number hungry, the i8 can hit 100 km/h from standstill in just 4.5 secs! 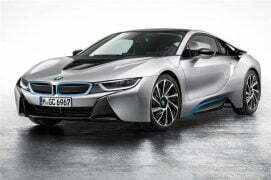 BMW i8 deliveries could commence in March. It is being said that only eight units of the i8 have been allocated to our country for the year 2015. Stay tuned to CarBlogIndia for more details from the BMW i8 India launch event.